Days Hotel Waterford is located in the heart of the city, overlooking the river Suir, just 5 minute walk from the train and bus stations. Formerly The Bridge Hotel, the property has been completely refurbished, and now offers 130 superb guest bedrooms, secure customer car parking, and excellent conference facilities.Timber Toes bar is popular with locals and residence alike, and is open throughout the day. 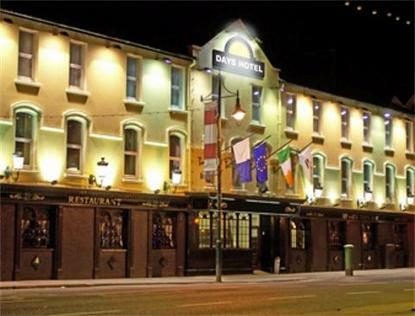 Serving a delicious selection of hot food, snacks and drinks, the bar has a relaxed atmosphere, with live music at weekends.Crokers Restaurant combines traditional Irish and European cuisine, specializing in local produce from Waterford and the surrounding area. Our team of chefs prepare an appetizing menu, and coupled with friendly, attentive service wine list, we will do our utmost to ensure you have an enjoyable dining experience.Car Parking is available in our multi storey car park, located on Anne Street, to the rear of the hotel. It is advisable to check in at the hotel before parking your car to obtain a pass and drop off luggage. Opening hours are from 7am to 9pm. If you need to enter or exit the car park outside these hours, you must give advance notice by contacting reception at 051 877 222. Charges are 2 Euro per night, if you are staying for 3-4 nights, you can avail of a multi day pass for 5 Euro. To Car Park - From Hotel reception, take the very first left turn onto Bridge Street, which is a steep street running parallel to the right hand side of the Hotel. Drive up this street and take the 2nd turn left onto Anne Street, by the Aldi supermarket. Approx 5 mins walk from the Hotel.